The Ain’t Rights are an under-the-radar punk band touring the country on siphoned gas when their big gig falls through. Desperate for cash to make the cross country trek back home, they decide to play for at a Neo-Nazi bar. 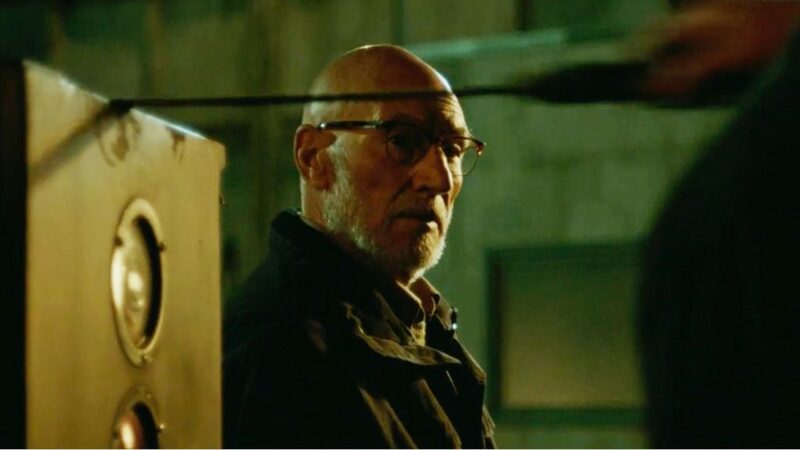 But when their bassist, Pat (Anton Yelchin) walks in on a grisly stabbing, the band is held hostage while the bar’s owner, Darcy (Patrick Stewart) decides their fate. The band and Amber (Imogen Poots), another witness, must keep their wits about them and fight for their lives as they try to escape from the bar’s green room. 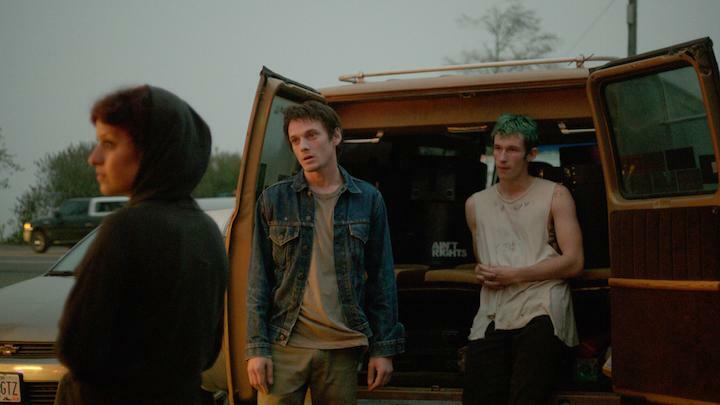 Horror and slasher film lovers will enjoy Green Room immensely. There’s nail-biting suspense, startling moments that will make you jump in your seat, and enjoy blood and brutality to thrill even the most rabid slasher fans, without being off-putting to the more squeamish viewers. Green room is also a long fuse with a big boom. The film starts slow and quiet, as we follow the band on their journey to their next gig. There are a ton of long, artistic camera shots of the band, their van, and the Oregon landscape as they make their way up the coast. We hear the band wax poetic about “being there” to experience their music, instead of uploading their music and lives on social media. You’d never guess this was a horror film. That is until Pat walks in on a girl with a knife in her skull. BOOM: The fuse hit the explosive! 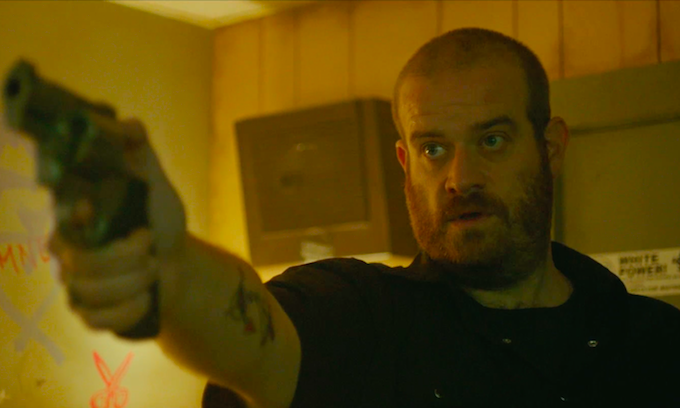 A desperate 911 call, people being locked in the bar’s green room, screaming, crying, and fighting over a gun and bullets (or rather, cartridges)… It’s a blur of machete-attack dog-shotgun-, and Neo-Nazi-filled chaos. The action keeps its pace as the group tries to negotiate with their captives and plan their escape. Ingenuity and lightning-quick reflexes keep them alive for a while, until Darcy and his men start picking them off one by one. The casting for this film is perfect. Patrick Stewart is terrifying. His quiet intensity as Darcy, the bar’s owner, is astounding. He never raises his voice. He never threatens. He just commands. He makes it so. (DO YOU SEE WHAT I DID THERE MY TREKKIE FRIENDS?!) Those who know Stewart from Star Trek or other jolly roles, such as Robin Hood: Men in Tights, are in for a rude awakening with this film. Patrick Stewart as a villain will quickly become America’s newest obsession. Anton Yelchin delivers a solid performance as Pat, but it’s Imogen Poots as the emotionally fragile and unpredictable Amber that steals the film. Her portrayal of this broken girl restores the humanity her identity as a Neo-Nazi stripped away. She swings from hysterical bawling to intense focus with ease and keeps the audience and fellow hostages on their toes throughout this whole ordeal. This entry was posted on Friday, April 15th, 2016 at 2:36 pm	and is filed under Film, News. You can follow any responses to this entry through the RSS 2.0 feed. You can skip to the end and leave a response. Pinging is currently not allowed. « Wow! ‘The Birth of a Nation’ Trailer is Here! You can relax for now. I'm not going to murder you in front of your daughter. That's being more rational than Bill led me to believe you were capable of.